Elation is excited to introduce built-in prenatal flowsheets! Elation’s prenatal flowsheets are quick and easy to use. 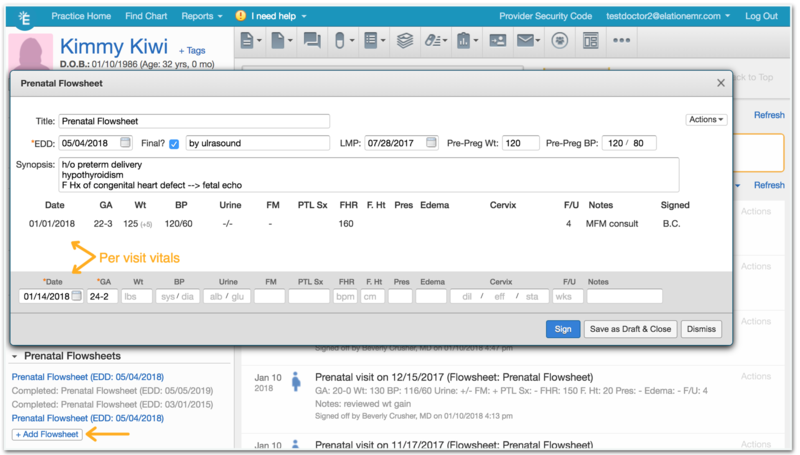 Add flowsheets with the click of a button, collaborate with staff and other providers, and easily share flowsheets and other relevant information with hospitals when it’s time for delivery. OB/GYN providers will have prenatal flowsheets available on all charts where the patient’s gender is listed as “female”. If you are an OB/GYN and do not have access to our prenatal flowsheets, contact us at usersuccess@elationhealth.com and we will turn it on for you! To create a new prenatal flowsheet, go to the Clinical Profile on the left-hand side of the chart and click the “+ Add Flowsheet” button, as seen in the screenshot below. The top of the flowsheet is designated for the entire pregnancy. The synopsis section can be used for a pregnancy-specific problem list, or any other notable elements about the pregnancy. At the bottom of the flowsheet, providers can add individual OB visits. The only required fields are the current date and gestational age. The gestational age calculates automatically once the Estimated Delivery Date (EDD) is completed. **The Notes section appears small, but has no character limit and will expand as notes are added. Since staff often times record weight, blood pressure, and urine, we’ve designed our prenatal flowsheets with those three vitals listed first. With this format, staff is able to record necessary vitals for individual OB visits and save them as a draft. When the provider goes in to see the patient, they can simply open the saved draft and review/add any additional information before signing off on the visit. Once the note is signed by the provider, a new row will appear on the flowsheet with their initials under the “Signed” column. You can hover your mouse over the initials to see the provider’s full name and credentials. Any provider in your practice can access Elation’s prenatal flowsheets through a patient’s Clinical Profile, which makes it easy for multiple providers to collaborate on the same flowsheet. Additionally, the “Signed” column allows you to see which providers saw the patient throughout her pregnancy at a glance. When a patient checks into the hospital for delivery, providers typically need to send the patient’s prenatal flowsheet along with key pregnancy lab results. The best way to gather and send the necessary information is by attaching the patient’s flowsheet, relevant labs, and Clinical Profile to an outbound Letter and eFaxing it directly to the hospital. For more information on sending letters in Elation, refer to this Help Center article. If your patient would like to have a copy of their flowsheet to bring directly to the hospital, anyone at your practice will be able to print the flowsheet via the Actions dropdown at any time. Once the pregnancy has been completed, open the patient’s prenatal flowsheet and click on the Actions dropdown to “End Flowsheet”. Q: Why are weight, blood pressure, and urine listed before the other pregnancy vitals? A: Since weight, blood pressure, and urine are often recorded by staff, Elation listed those first to make it easy for providers to visually confirm vitals entered by staff. Q: What if my patient is going to have multiple births (twins, triplets, etc.)? A: If a patient is going to have twins, triplets, etc, you may need to record multiple vitals for the fetus. Since the fetal heart rate is typically the only item needing to have multiple records, we recommend putting all fetal heart rate recordings next to each other, separated by a slash. Please contact us at support@elationemr.com with any other questions or feedback - we’d be happy to help!